Note: Must buy in pairs for your normally talking use. 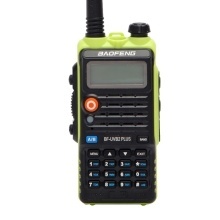 BAOFENG BF-UVB2 PLUS is a dual band radio. This easy-to-use radio will deliver you secure, instant and reliable communication at peak efficiency. *Dual-band handheld transceiver: VHF136-174 / UHF400-520(MHz), Dual Band, Dual Frequency. Up to 128 memory channels. *CTCSS/DCSS intelligent encryption, FM Radio. And practical flashlight function, to solve the emergency needs in the dark environment. *4800mAh High Capacity: Long standby time. With low voltage alert and overcharge protection. Whole machine charging, single battery charging optional. *With luminous LCD display function, highlighting screen, and luminous key effect. With voice prompt and function VOX(voice operate transmission). *Super quality material with oxidation resisting function. Double layer steel mesh to protect the loudspeaker effectively. *Mini Size, compact design, body is with anti-skid texture. Ergonomic design, easy to hand-hold and operate.